The cycles of positive and negative pressure aids in improving circulation. 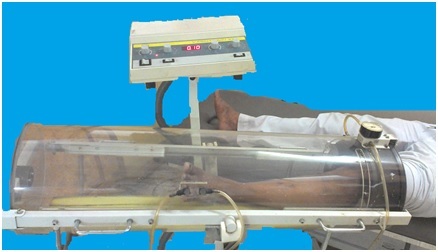 The volume of an elastic vessel can be increased by the application of a vacuum force on its outer wall In the negative pressure phase of VCT , just such a force is exerted on the extremities and its vessels.In the positive pressure phase, the venous drainage is facilitated.Thus the alteration of positive and negative pressure facilitates increased arterial and capillary circulation and better venous drainage. Literature evidences suggest the therapy for one hour on alterative days for ten sessions . The individuals should be instructed that they will feel sense of pull during negative pressure phase and sense of push during positive pressure phase. Any uncomfortable sensations should be repored immediately. There may be few temporary side effects like tingling and numbness may occur. 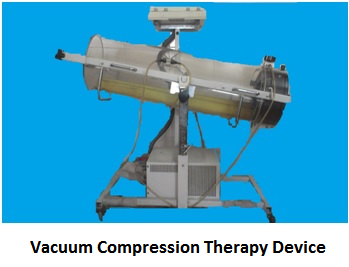 Effects of vacuum-compression therapy on healing of diabetic foot ulcers: randomized controlled trial. ↑ 1.0 1.1 Akbari et al ; Effects of vacuum compression therapy on healing of diabetic foot ulcers :Randomized control trial ;JRRD; Vol 44; No 5;2007; 631-636. ↑ Nave CR, Nave BC, eds. Physcs for the Health Sciences. Philadelphia, Pa: WB Saunders CO; 1975:73-75.